Commissioners Sam Nibert, Rick Handley and Tracy Doolittle, pictured, discussed the roadways in the county at the commission’s regular meeting this week. 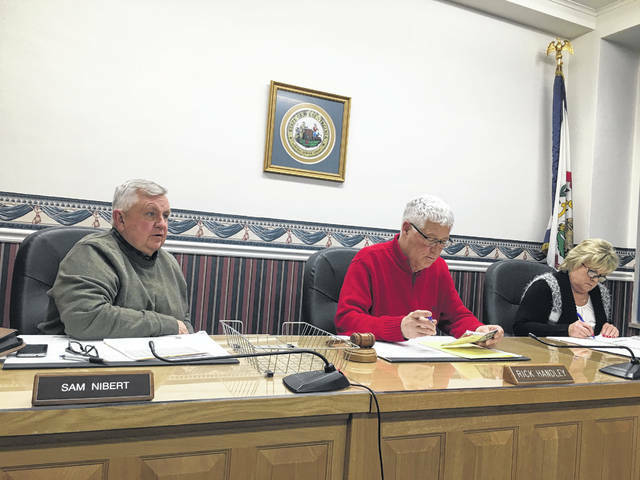 POINT PLEASANT — The Mason County Commission recently met discussing the condition of the roads within the county. Commissioner Sam Nibert discussed with his fellow Commissioners Rick Handley and Tracy Doolittle all of the activity which takes place on the roadways in Mason County by everyday local travelers, school bus drivers, meal delivery drivers, first responders, and law enforcement officers and and how the state of the roadways cause wear and tear on vehicles as well as increases the time of travel from one location to another. Handley commented Governor Jim Justice has mentioned his want to put money into secondary roads within the state. The commission approved drafting a letter to the secretary of transportation requesting more funding come into the local department of highways garage. Also, the letter will be sent to all elected officials who represent Mason County as well as the district supervisor. In other business, the commission welcomed the new Tu-Endie-Wei State Park Superintendent Steven Browning to Mason County. Browning shared he has many tasks assigned to him to help make the park the best it can be with one of those tasks being maintenance on the park’s flag pole. Dennis Zimmerman, emergency manager/director of Mason County Office of Emergency Services, was in attendance to discuss new hires and a new organizational plan for the OES with the commission. The new organizational plan will increase efficiency, reduce administrative cost, and allow the OES to meet the increasing demands on the agency’s grant requirements, according to Zimmerman. The commission approved the appointment of Matt Gregg to the position of Director of Homeland Security and Emergency Management. Also, the commission approved to increase the salary of Scott Donley, emergency operations technician/ building and flood permit handler, by $2,000 with his benefits package remaining the same. Zimmerman also addressed a proposal in the legislature at this time regarding 911 fees which would result in a reported 11 percent decrease in funding.